Pisco sour is the national drink, and Peruvians take their Pisco seriously. 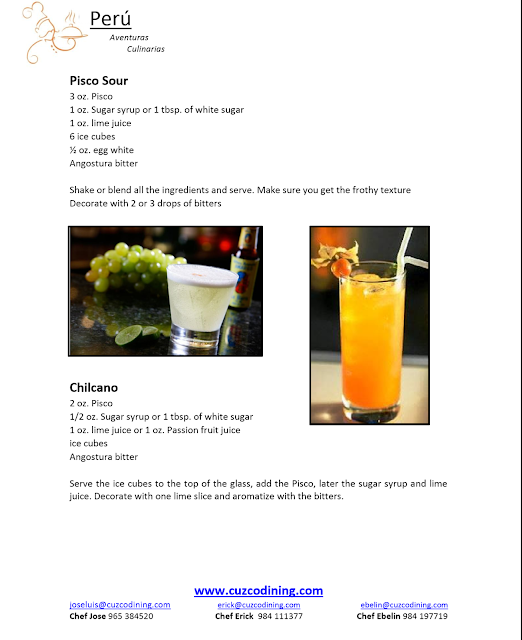 There are a hundred variations of the drink, using Pisco infused with the vast varieties of fabulous tropical fruits of the region. Every restaurant has it's own special recipe; it's sort of like Grandma's chicken soup, everybody's Grandma makes it a little differently, and everybody thinks their Grandma's is the best. I couldn't get past the foamy egg white, it just wasn't appealing to me. So early in the trip I discovered the Chilcano, which was more to my liking. I'm a gin & tonic girl, and the Chilcano is a little more similar to that, as they top off the juice with a little ginger ale. It's all part of the cultural experience, Gary. Yeah, that's why. Well it'd just be down right rude not to have one! Or two. That's just what I thought, Jeff!